This model runs in OpenCell and COR. This version is able to reproduce figures from the original publication, although some tweeking of variables is required to produce the full range of figures. The model is currently parameterised to reproduce Fig 2a. The units have been checked and they are consistent. ABSTRACT: In this study, based on currently available experimental observations on protein level, we constructed a mathematical model to describe calcium homeostasis in normally growing yeast cells (Saccharomyces cerevisiae). Simulation results show that tightly controlled low cytosolic calcium ion level can be a natural result under the general mechanism of gene expression feedback control. The calmodulin (a sensor protein) behavior in our model cell agrees well with relevant observations in real cells. Moreover, our model can qualitatively reproduce the experimentally observed response curve of real yeast cell responding to step-like disturbance in extracellular calcium ion concentration. Further investigations show that the feedback control mechanism in our model is as robust as it is in real cells. A simplified diagram of the calcium fluxes described by the mathematical model. Extracellular calcium enters the cell cytosol through an unknown Channel X and also, under certain conditions such as depletion of secretory calcium, through the channel Cch1p-Mid1p. 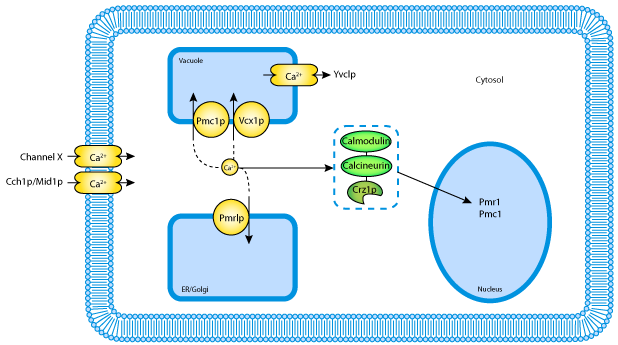 Cytosolic calcium can be pumped into the ER and Golgi through Pmrlp and into the vacuole through Pmc1p and Vcx1p. Under the abnormal condition of extracellular hypertonic shock, the vacuoles can release calcium into cytosol through Yvclp. Cytosolic calmodulin is a calcium-binding protein which in its bound form can activate target proteins such as calcineurin. Activated calcineurin dephosphorylates the transcription factor Crz1p, promoting its translocation into the nucleus where it regulates the transcription of genes such as Pmr1 and Pmc1. Derived from workspace Cui, Kaandorp, 2006 at changeset a1009eb25b24.